Cambodia to us, as I think it is to most, is a country full of mystery and surprises waiting around every corner. Its gruesome past, still very recent and alive in the minds of the Cambodian people, has tainted the country in a way many foreigners are reluctant to let go of. The violent Khmer Rouge which came into power after winning the Cambodian civil war in 1975 lingered until 1999. They even held a UN seat until 1993 even though they had been defeated and living in exile in Thailand since 1979! How crazy is that?! When we told people we were going to Cambodia we got a pretty stark contrast in responses. Those who had never been there and only heard about Cambodia through the media were a little hesitant, warning us to be careful and stay safe and asking us if we were going with a tour, while those who had been there said things like “That’s amazing!” “I love Cambodia!” “You’re going to have such a great time!”. It’s funny how the media colors our impression of a place we’ve never even been. As for us, we’re in the “We love Cambodia” camp. It would be way faster for me to list the things I didn’t like about the country than the things I did. But, don’t worry, I’ll give it a go. 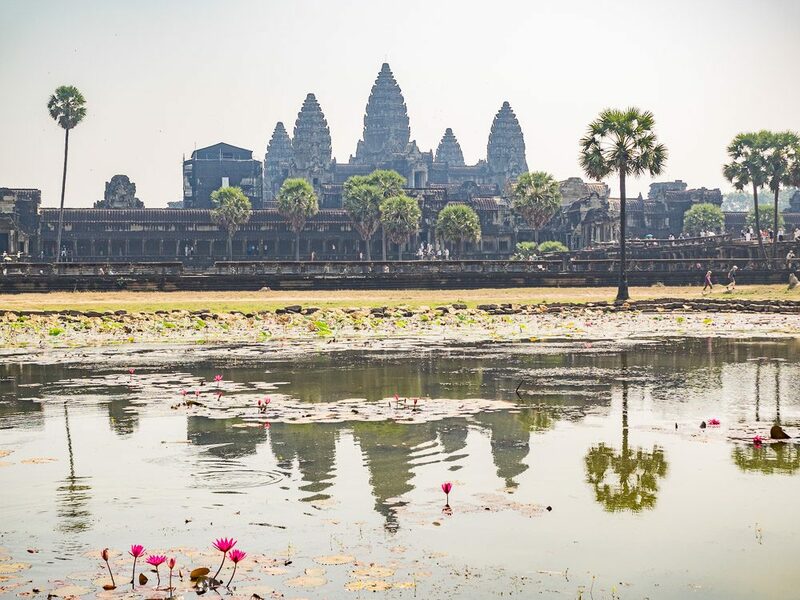 Let’s start with the country’s main tourist attraction, Angkor Wat, and its surrounding temples. I can definitively say I’ve never seen so many temples in one place in my entire life. And I mean HUGE ancient temples. It’s absolutely incredible, and a good reason why the temples of Angkor Wat are such a tourist draw. Next, the people. The Cambodian people are some of the nicest, friendliest people I have ever met. And their English is amazing. Actually, their command of languages, in general, was super impressive. I’ve never heard local tour guides speaking in so many languages before. Usually, your only options are the local language and English, but I heard tours in Chinese, Spanish, French, and I’m sure a bunch of other languages I couldn’t recognize, all lead by local Cambodian guides. It’s incredible! Never before have we had so many locals come up to us not to sell us something, not to take a selfie with us, but just to talk or say hi. Cambodians are awesome. After the people comes one of the things I love most about travel, the food. If Thai food and Chinese food had a baby, it would be Cambodian. Cambodian food is basically a perfect cross between the two. There’s a lot of yummy stir fries, but also quite a few coconut-based foods, and their fried noodles are definitely more resemblant of Thai noodles than Chinese. We were lucky to have this super local food stand right around the corner from our hotel so we got to try all the things right off the bat. 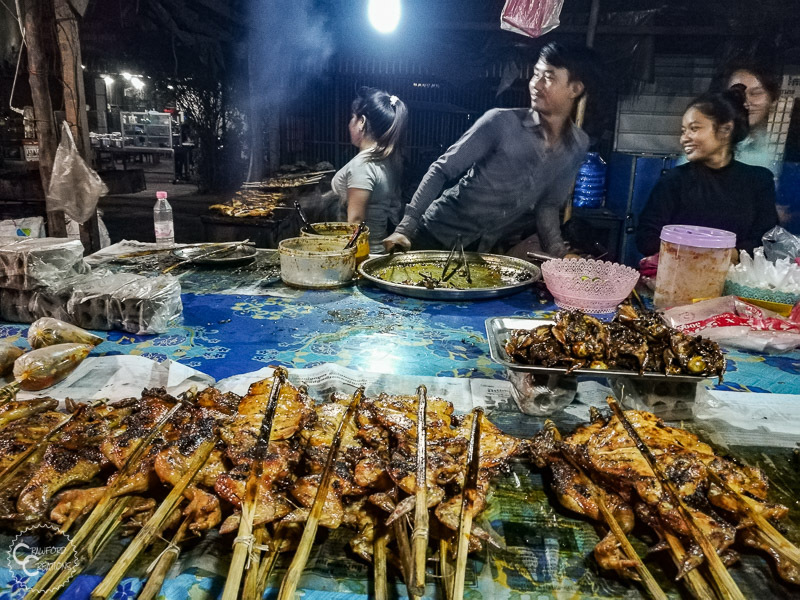 Our favorite Cambodian foods include Cambodian barbeque chicken, num krok (rice cakes), fried spring rolls, noodle salad, fried noodles, and fruit shakes. Oh, also, the local restaurants in Siem Reap serve all their food for only $2 US dollars. As in literally every meal on their menu only cost $2. It’s insanely cheap. Also, those fruit shakes we love so much that we bought every day only cost $1 each. And they serve up some nice sized shakes. Plus you know they’re super fresh because they cut up the fruit and make it right in front of you. 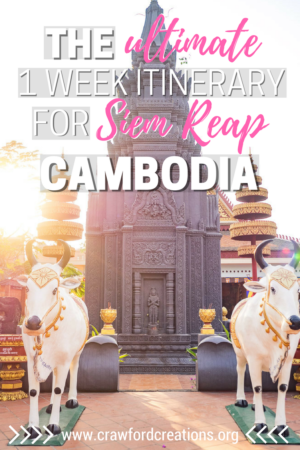 I guess that leads me to another reason why you should travel to Cambodia, it’s super cheap. Actually, let me amend that statement, the cost of living is super cheap, meaning your accommodation and food costs will be really low. I think they try and make up for that with the entrance fees to all their tourist attractions though. Almost everything there is for a tourist to do costs at least $20. And yes, that is 20 US dollars, because they use USD as their primary currency in Cambodia. Anyway, in general, Cambodia is super cheap in terms of accommodation, food, and any sort of souvenirs you might buy. They’re EVERYWHERE!!! We got too many mosquito bites to count in Cambodia, and that was with bug spray. That was one bad thing I heard about before we came that actually held true. Come prepared to deal with lots of mosquitos in Cambodia. We came in the dry season, but I’m pretty sure the red dirt and sand that literally coats everything in Cambodia would be just as obnoxious, if not more so, in the wet season when it becomes mud. Actually, yeah, I can imagine it being way worse as mud during the wet season. But for real, you can’t go out in Cambodia without coming back coated in red dirt. We would rinse our faces off in the sink thinking we got all the dirt off only to dry ourselves with our hotel’s white towels that would immediately be stained red. All in all, the positives definitely outweigh the negatives. 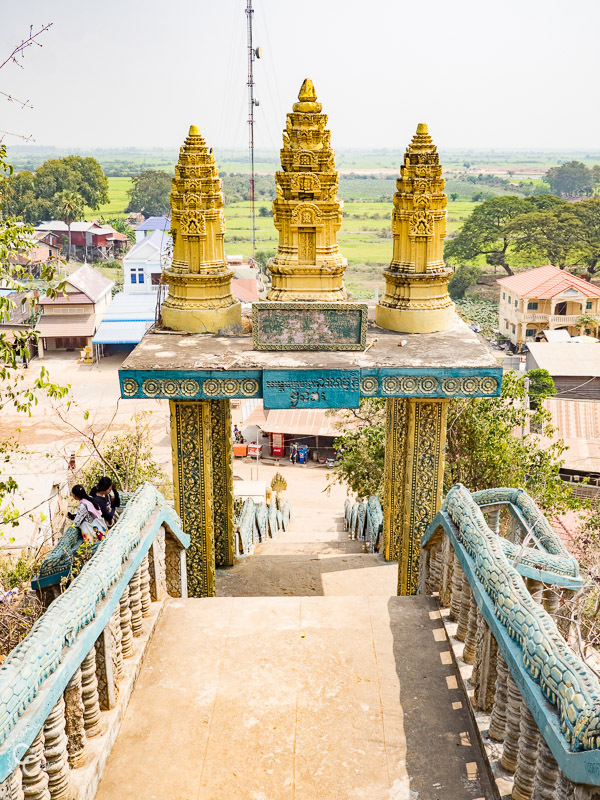 With that said, come follow us to Cambodia! We arrived in the afternoon, which didn’t leave much time for exploring, but luckily we took the recommendation of the receptionist at our hotel and walked over to the local market down the road in the opposite direction of town. He told us that the Old Market was just for tourists, but that this one is where all the locals go for food. I’m so thankful he told us about it because I didn’t see these barbeque chickens anywhere else in town and they were amazing! We went back three more times just to get this chicken. We stopped at the Phnom Khrom Temple on our way to the Tonle Sap, only to find out that you need your Angkor Wat ticket to get in, which we hadn’t bought yet. Good thing the entrance to the temple was absolutely gorgeous! Once arriving at the Tonle Sap we took a boat tour of the Chong Kneas floating village. The village itself was actually cooler than I expected it to be, and having a guide meant we really learned a lot about the village and the people that live there. Tickets for the boat cost $20 per person, guide included. Unfortunately, there are a lot of scams going on with this tour and they will try to upsell you a lot of things in the name of “helping the children”. This is a scam. Don’t buy rice or noodles to feed the school. They’ll try to get you to pay $50 USD for a 50 kg bag of rice, but you’re not actually feeding the kids at the school. In fact that bag of rice never actually gets opened, the school just sells the rice right back to the vendor you bought it from. I guess technically you would still be helping the school since they get money, but the gist of the story is that it’s not what it seems. The tour doesn’t actually go into the main part of the village, just around it. This was a major plus for me as the boats were loud, and plentiful on the lake so at least we weren’t disturbing the locals too much by motoring past their houses. The water was really brown during the dry season, but our guide insisted that during the wet season it gets really clear. On our way back from the Tonle Sap Lake we stopped to explore this awesome temple we passed on the way there. This temple is outside of Siem Reap south of town and it’s absolutely beautiful. The entire place was so colorful and you can only see a portion of how many stupas there were in this photo. It was so fun to walk around this place taking photos. It is an active temple but there was no one there worshiping when we visited. We ended the day with sunset at Phnom Bakheng Hill. Pro Tip: You don’t need a ticket to enter the Angkor Wat temple grounds after 5:30. Which means you can come to Angkor Wat any day of the week after 5:30 pm for completely free! 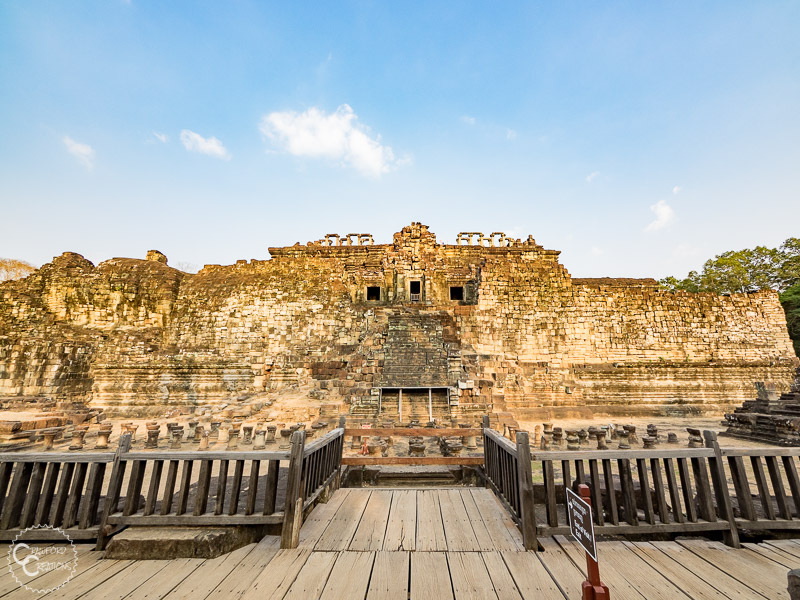 The catch is that there are only 2 temples in the whole complex that are open after 5:30, Phnom Bakheng and Pre Rup. Phnom Bakheng is the most popular place to watch the sunset at Angkor Wat because it’s up on top of a hill. They limit the number of people allowed at the temple at any one time, so you’ll probably have to wait a few minutes for some people to come down before the guards let you into the actual temple. Even if you don’t get let into the temple in time for sunset, never fear, there’s still great sunset views from the top of the hill outside of the temple. In fact, that’s where this shot was taken! 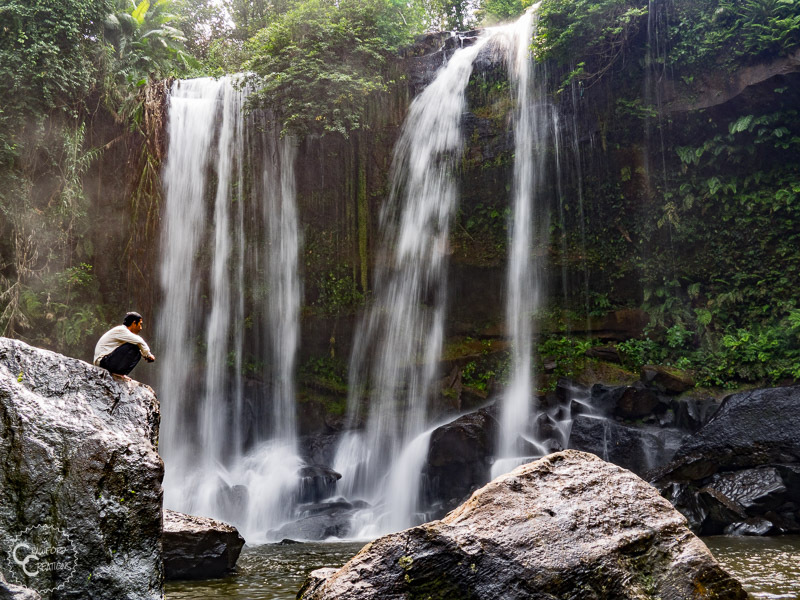 Phnom Kulen National Park is located 60 km outside of Siem Reap about 1.5 – 2 hours on a motorbike or in a van. Cars and vans are only permitted to enter the park before 12 noon, so if you’re taking this form of transport be sure to leave Siem Reap early in the morning. We rode our tandem bike and it took us about 2 hours to reach the entrance at the bottom of the mountain and then almost another whole hour to climb up the crappy dirt road for 12 km up the mountain. Tickets cost $20 per person. The first and most popular stop, once you reach the checkpoint at the top of the mountain, is Phnom Kulen Waterfall. There were a ton of locals here picnicking and swimming under the waterfall. The water is super cold so we couldn’t stay in very long, but it is absolutely beautiful to look at. Unfortunately, there’s no good space at the bottom of the waterfall to sit and enjoy the view. Because of this, the few rocks there are to sit on below the falls are super crowded and it’s really hard to find a spot. Also, there’s nowhere to set your stuff down without paying to rent a locker. Fun fact, this is the waterfall that Angelina Jolie jumped off of in the movie Tomb Raider! Well, at least they made it look that way. The water isn’t very deep in the pool at the bottom, and with all those rocks, jumping off the top of the falls would be a very poor decision. The magic of cinema! 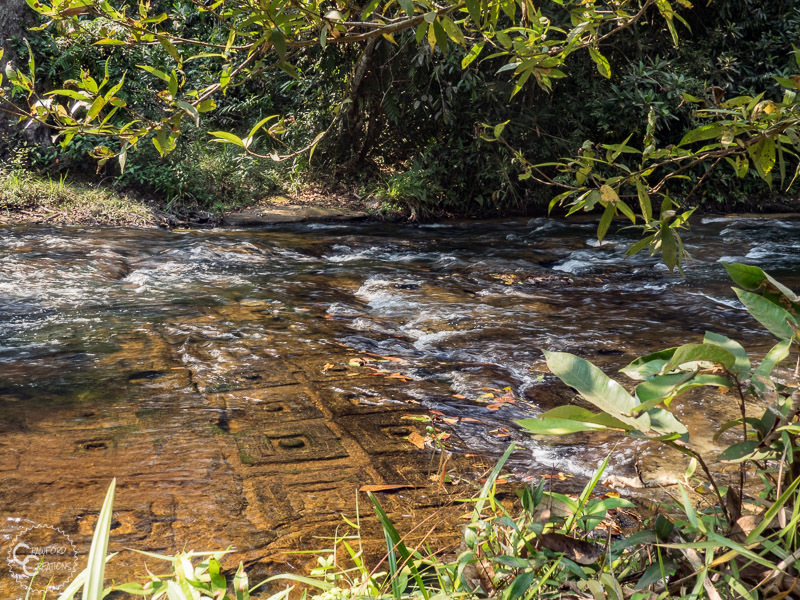 Our next stop in Phnom Kulen National Park was the 1000 Lingas. These are a succession of 1000 carvings in the rocks underneath of this stream. I’m not sure if there was water flowing here when the lingas were originally carved, but if there was, I can’t imagine how annoying this would have been to carve under water. Kind of amazing when you think about it. 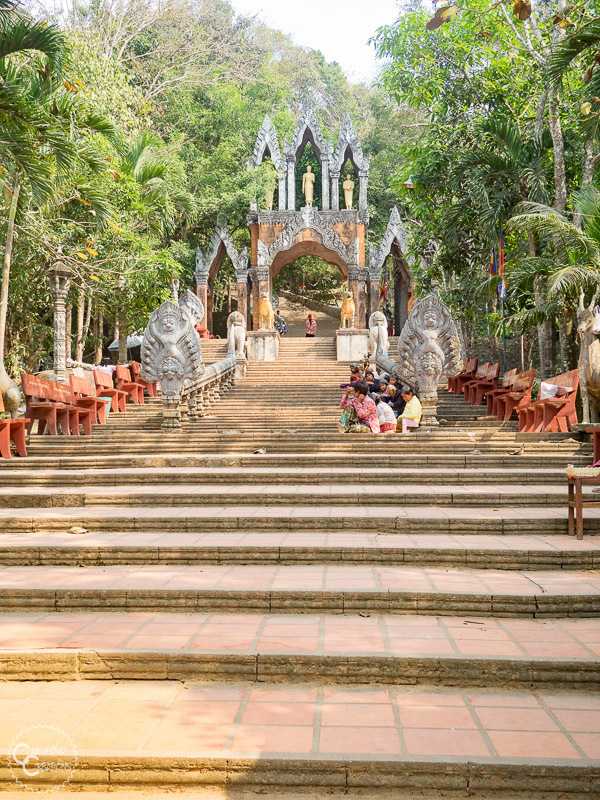 Our final stop in the park was the Phnom Kulen Temple. Honestly, the entrance to this temple was the more impressive than the temple itself. There were also a lot of kids here asking us for money and trying to charge us $1 for looking after our shoes when we walked into the temple. Just a word of warning, do not give money to the children in Cambodia, even if they’re only asking for $1. A local explained it to us like this, if the parents see that the kids can make money begging, then they won’t let them go to school and get an education because of the immediate benefits the child is bringing to the family by getting money from foreigners. If the child can’t bring in money on the street, then the parents are more likely to send them to school so they can get a good job and provide for the family later in life. 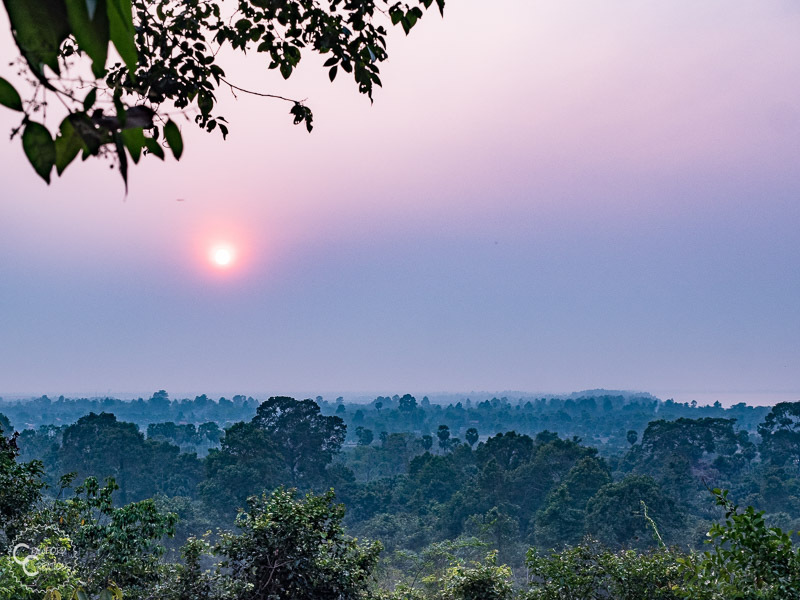 On the way back to Siem Reap from Phnom Kulen National Park we stumbled upon the sun setting right in between the temples of Pre Rup. This photo was taken from just outside of the temple. Little did we know this was one of the temples that are open until 7, so we could’ve gone in! It was still a beautiful sunset from the outside though. We rode our tandem over to Angkor Enterprise to buy our 3 Day Angkor Wat Pass. There was some confusion as to where the ticket office was located as apparently it moved at the beginning of 2018 from the checkpoint near Angkor Wat to Street 60 where it now resides. You can find the ticket office right next to the Angkor Panorama Museum and across the street from the Asia Traditional Museum. Tickets cost $37 for a 1 Day Pass, $62 for a 3 Day Pass and $72 for a 1 Week Pass. 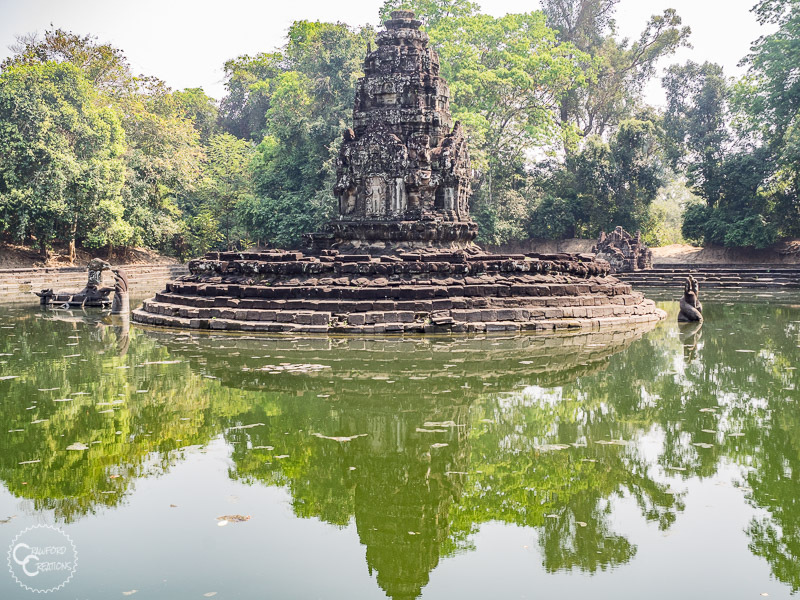 The first temple you come to after passing by Angkor Wat is Baksei Cham Krong. It’s also the only pyramid shaped temple in the whole complex, and one of the only ones that has no tourists swarming its steps. If you want photos with no tourists in them, this is a good place to get them. 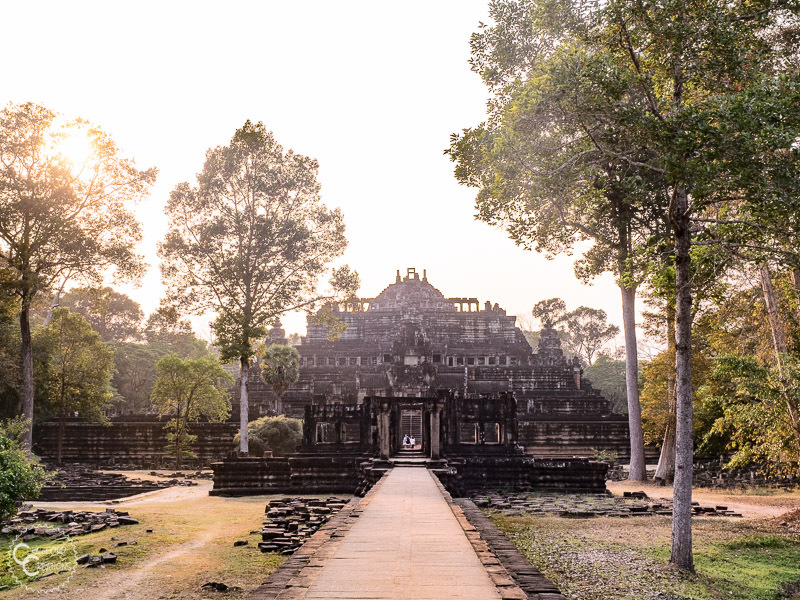 We got a bit of a later start to our exploring today after our long day out at Phnom Kulen the day before, so we decided to avoid the major crowds at Angkor Wat and head straight for Angkor Thom. 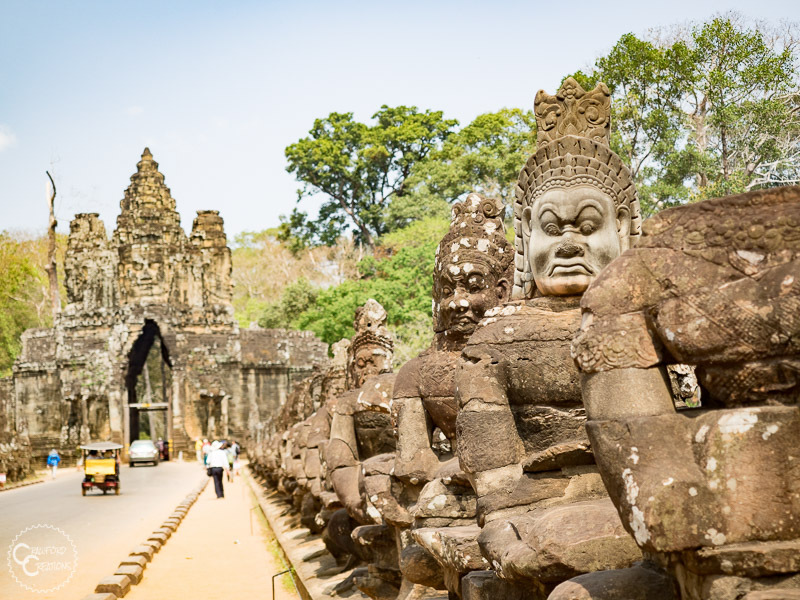 This is the incredibly picturesque entrance to the city of Angkor Thom. The statues along the sides depict what looks like warriors pulling a giant snake. This image is depicted in many places around the Angkor Wat temples and symbolizes the fight between Gods and Demons that ended with the beginning of time and the creation of the universe. I’m still not sure what the significance of their tug of war “rope” being a snake is. The exact info about the history and symbolism of the reliefs and depictions around Angkor Wat is still a bit of a mystery. Even different guides will tell you different stories about the same things. But that’s part of the fun in a way, some things here are just left to your imagination. 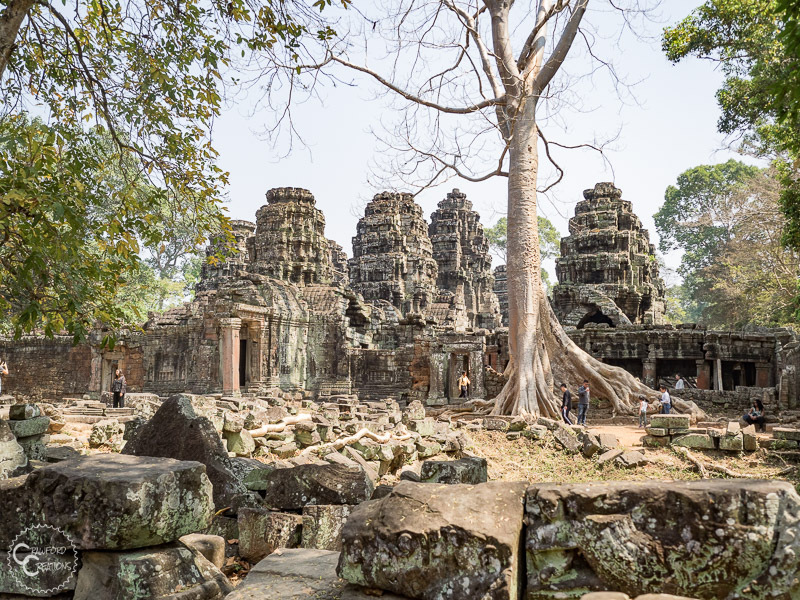 The main temple inside of Angkor Thom is Bayon, and it also happened to be one of our favorite temples of all the 20 or so temples we saw at Angkor Wat. Bayon is the inspiration for the temple that was raided in the movie Tomb Raider. You know, that scene where all the workers are pulling down that giant stone face to gain access to the inside of the temple? Well, that actual face doesn’t exist because all the faces of Bayon are up on the towers at the top, but it is based on the faces of Bayon. 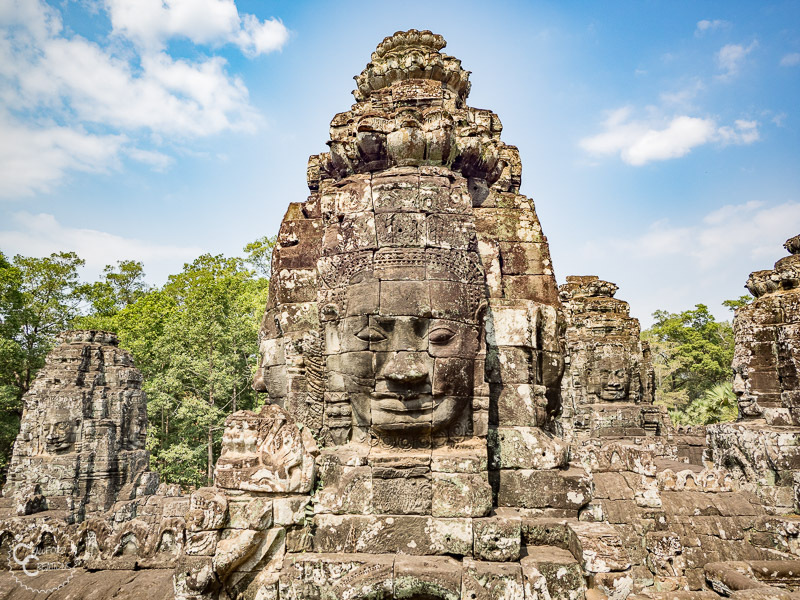 Be sure to take your time exploring Bayon, it’s way cooler than Angkor Wat in our opinion. If there’s one temple I would go back to again it would be this one. Next up after Bayon was the Preah Pithu temple group which is located across the road from the Elephant Terrace. Preah Pithu is a group of much smaller more run down temples with virtually no tourists around. A nice change from Bayon. 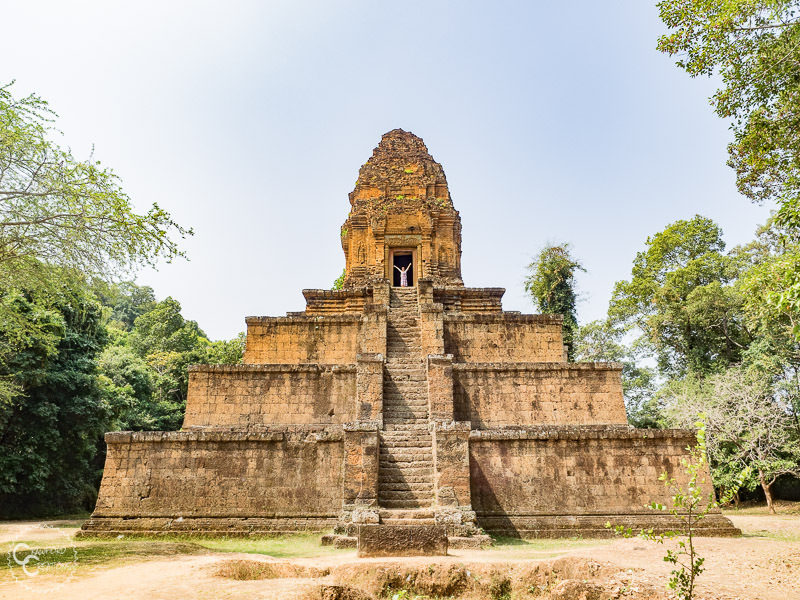 There are many little temples to discover and climb around in this section of Angkor Thom so channel your inner explorer and go to town. Adventure awaits! After exploring the more ruined temples of Preah Pithu, we walked across the road to the other side of Angkor Thom to Elephant Terrace. At first glance, the elephant terrace is not very impressive because it is just that, a terrace not a temple. But, it’s actually the entrance to a much cooler set of temples behind it back in the woods. Walking straight back from the Terrace of The Elephants we came upon the walled area known as the Royal Palace that houses the Phimeanakas Temple. This temple has lots of interesting hallways lined with square windows to walk through and overall is just really fun to explore. Walking out the side exit of the Royal Palace towards Bayon you’ll come to the last major temple in Angkor Thom, Baphuon. This temple depicts a Buddha lying on its side. You can see the face and the belly of the Buddha bulging out on the left wall of the temple. 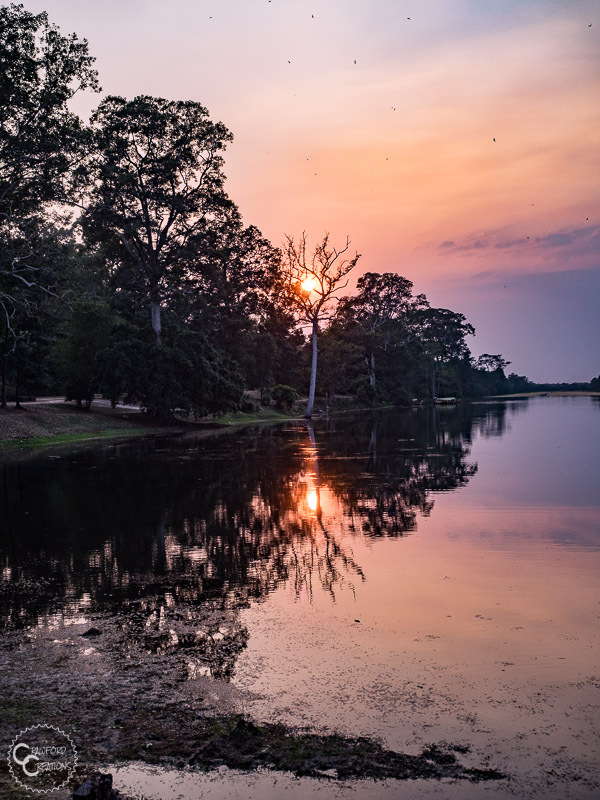 We were lucky to catch the sun setting over the moat around Angkor Thom as we left the temples. All the moats and lakes around Angkor Wat make for great sunrise and sunset spots. 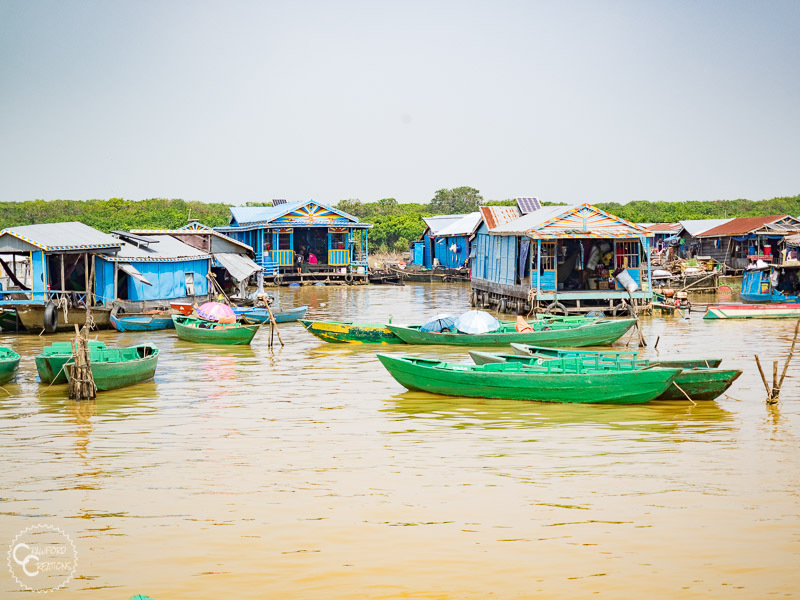 Kompong Phluk is another fishing village located near the Tonle Sap Lake. 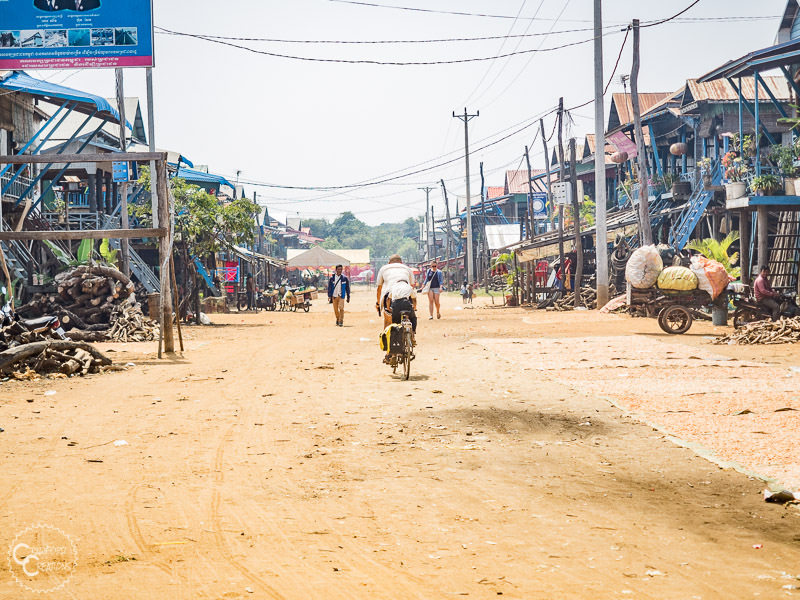 Unlike the floating village of Chong Kneas, this village is on stilts and located not on the lake, but next to a river that feeds into the lake. During the wet season, the water covers the road and rises up almost to porch level on the houses. The villagers trade their bikes for boats and row instead of ride down the streets. Since we visited during the dry season we could ride our bike or walk through the neighborhood. All the neighborhood kids loved our tandem bike. The kid in this photo was even brave enough to jump on the back and go for a ride with Justin. He couldn’t quite reach the pedals but the smile on his face said he couldn’t care one bit! Unlike our experience at the Chong Kneas floating village, there are no scams going on here and we didn’t feel at all like people were trying to guilt us into donating money that may or may not actually be for a good cause. There was one woman who asked us if we wanted to buy a book for the school, but that was it. The entrance fee for Kompong Phluk was also way more reasonable than Chong Kneas (although it won’t be in the wet season when you have to take a boat). To walk around or ride your bike around the village (available during the dry season only) costs just $5 per person. We started off our second day exploring the Angkor Wat Temples with the main attraction, Angkor Wat. I feel like Angkor Wat is one of those super famous overly hyped places that you just have to see even though it’s really not that cool. Because it wasn’t. In fact, Angkor Wat was the least impressive of all the temples we saw. The most impressive thing about it was its size. It’s one of those monuments that’s just so big you can only really appreciate it from the outside looking in. Once we got inside it was really pretty boring. There’s only one wall of really nice carvings and then the rest of it is just really bland. As you can probably tell from this photo it’s also majorly packed with tourists, which any of you that have been following us for a hot minute will know we hate. Because of the volume of tourists at Angkor Wat it’s also become super commercialized. It’s one of those places where at the exit they funnel you through a line of souvenir shops with pesky shop owners shouting at you to buy all the things you don’t want or need. Maybe it’s social pressure but I still feel like you can’t skip Angkor Wat when you come here. It’s just too iconic. My recommendation? Spend most of your time walking around Angkor Wat on the outside. It’s where you’ll get all the best views of the temple with the least amount of crowds. Our next stops after Angkor Wat were Kraol Romeas and Prasat Tonle Sngout, but, uh, apparently they weren’t photo worthy because I ain’t got one. 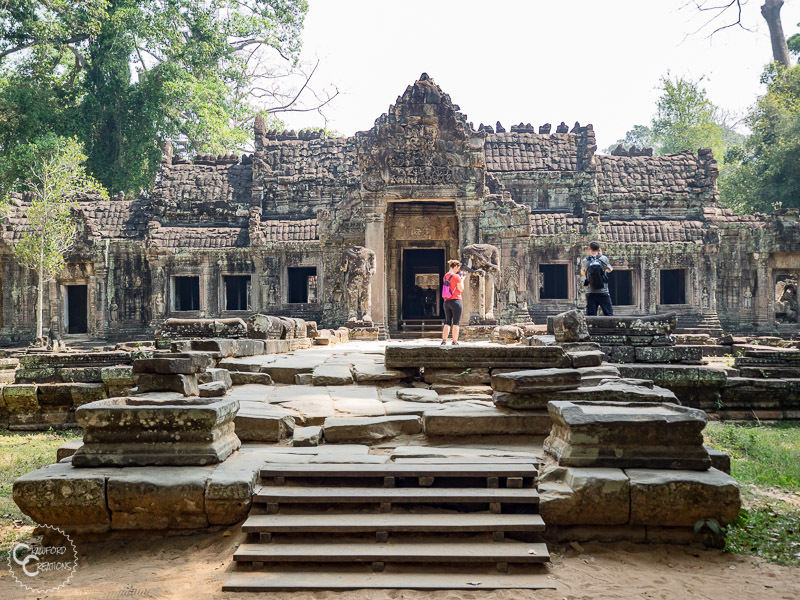 So we’ll skip ahead to the next super cool temple, Preah Khan. This is the backside of the temple which has a huge tree growing out of it. So freaking cool! Before we went to Angkor Wat I thought the reason that Ta Prohm was so cool wasn’t just the fact that it was featured in the movie Tomb Raider, but also that it was super unique in having that giant tree coming out the top of it and being taken over by the jungle. 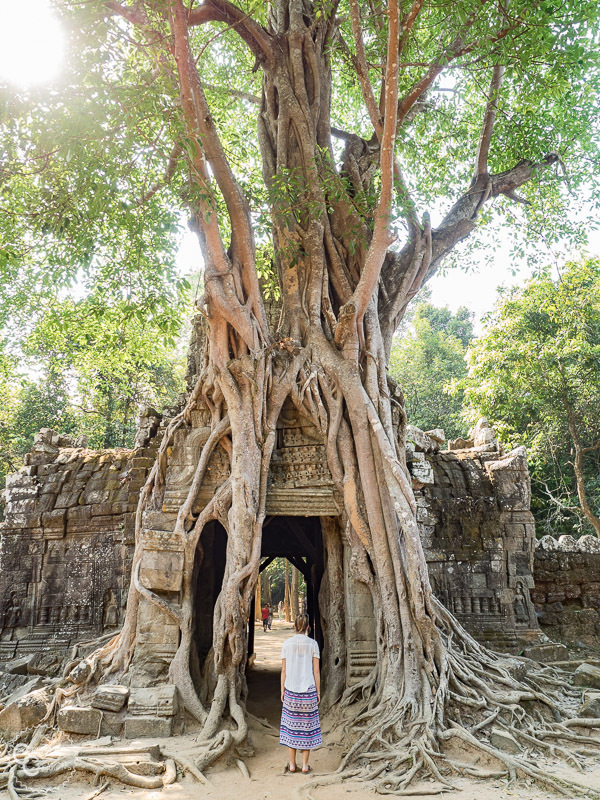 In reality, there are multiple temples that look just as cool as Ta Prohm but are way less touristed. Preah Khan is one of them. Next on the route was Neak Poan. This temple is literally located in the middle of a swamp. They’ve built a wooden boardwalk for tourist to get from the parking area by the road to the temple itself. 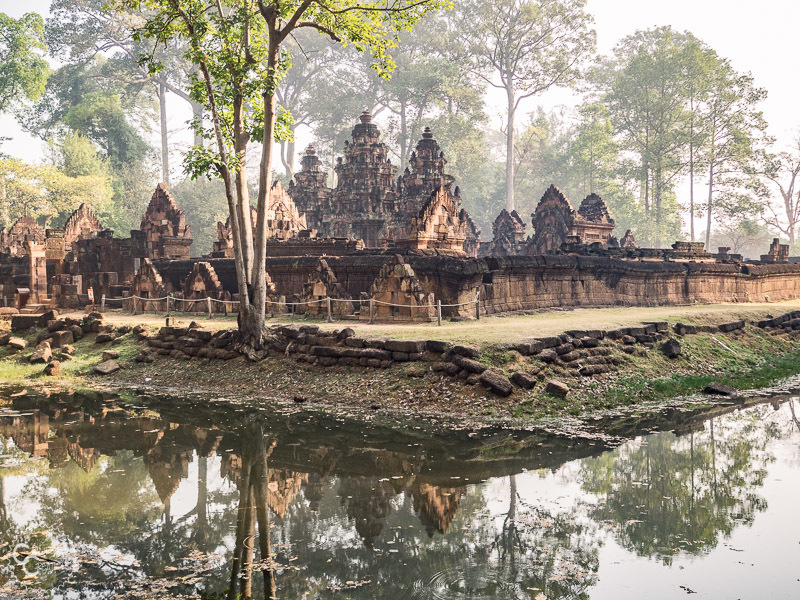 All the temples at Neak Poan are surrounded by water, which makes for some awesome reflections. 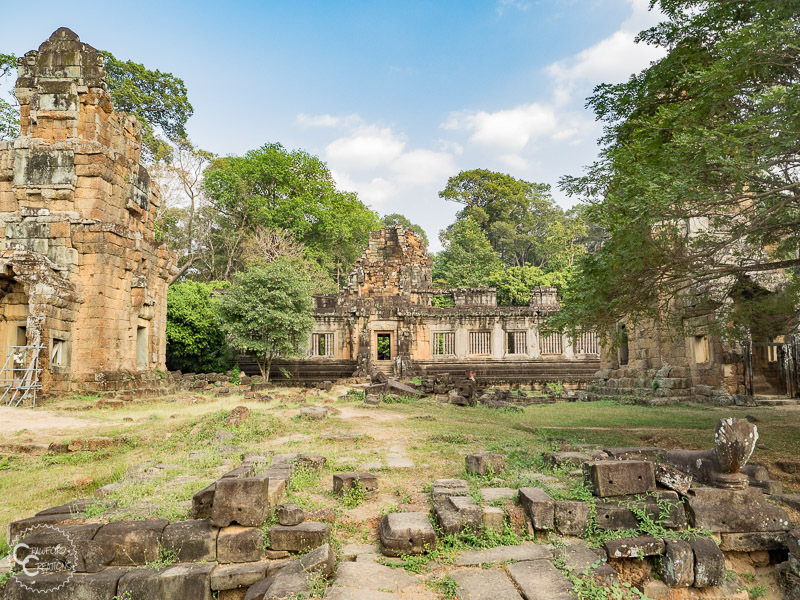 Across the road from Neak Poan lies this tiny ruined temple called Kraol Ko. It’s really small and pretty rundown, but absolutely tourist free! 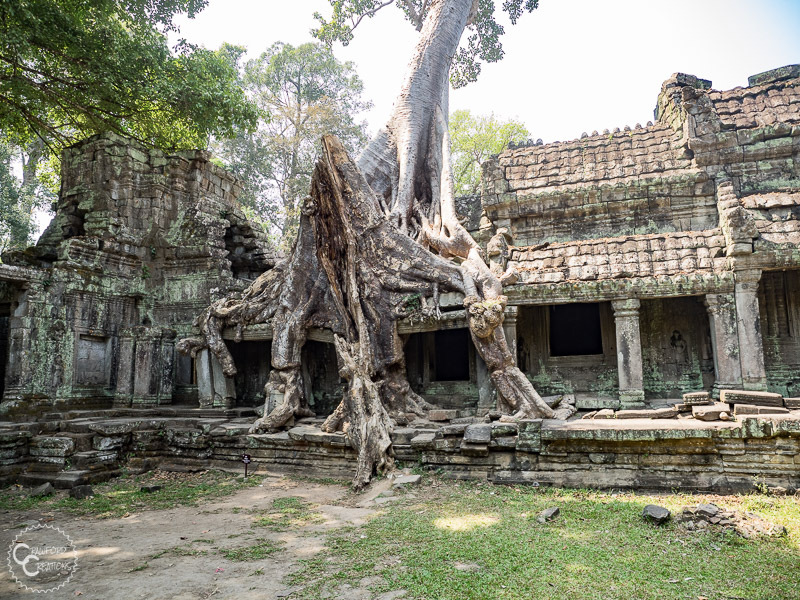 Speaking of temples with trees sprouting out of them, Ta Som is another jungle claimed temple, also pretty devoid of tourists. This tree covered exit at the back of the temple is definitely its coolest attribute. I couldn’t get enough of taking photos of this spot. I just love how the jungle started reclaiming all the temples here. Like, move over tiny humans, you ain’t got nothing on us! Our final temple of the day was East Mebon. This temple was super different from all the other temples we had seen so far. Instead of stone, it’s made out of sandstone bricks. The brick doesn’t lend itself to carving very well, so we found East Mebon to not be as impressive as some of the other temple’s we’d seen. Plus the brick just gives it a different look that we just didn’t find as appealing as the stone temples. Not sure why. Could just be a personal preference, or maybe it’s because brick has a more modern look to it. Who knows. We took a break from temples and floating villages today and explored more of Siem Reap. 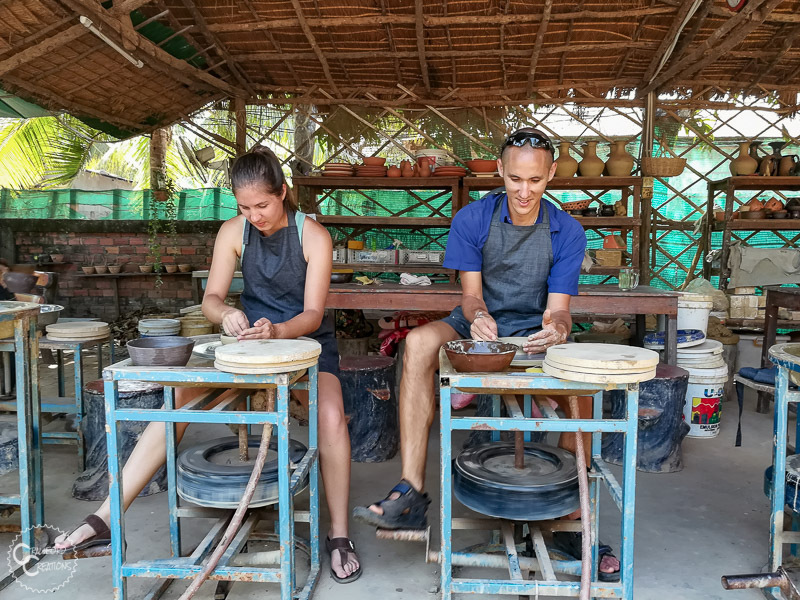 In the morning we took a 1 hour pottery class at a local pottery place we passed on our way to the Tonle Sap. The school had options for a “fun class” and a class where you actually get to take home the piece of pottery you make. We had no room in our bags to take home pottery without it breaking so we did our class just for fun. We each made a bowl, a cup, and a vase using the pottery wheel. It was super fun. I used to take pottery class when I was younger so this definitely brought back memories! $10 for a pottery making and carving “fun class” and $20 for the class where you get to take home your pottery. Later in the afternoon, we walked across town to Wat Prom Rath, a temple near the river in downtown Siem Reap. This is an active temple and the monks were there “giving mass” for lack of a better description (whatever the equivalent of that is in Buddism). It was a beautiful temple, although admittedly not as cool as the other Wat temple we visited outside of Siem Reap on day 2. 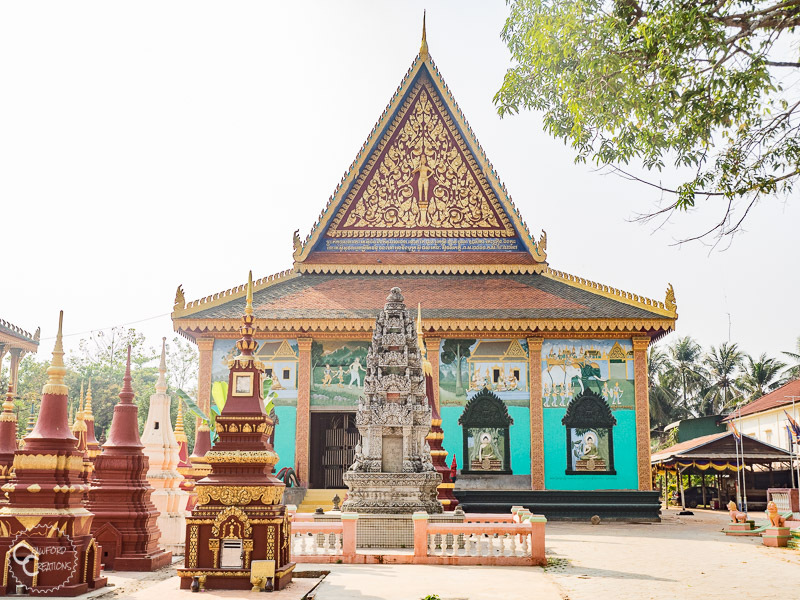 We debated riding our bike to this temple because it’s a bit far from Siem Reap and pretty small in size, but man are we glad we went! Banteay Srei was definitely worth the 30 km ride as it ended up being one of our favorite temples of the entire trip! Banteay Srei is perhaps the most unique temple of all the Angkor Wat temples. It’s known colloquially as the Pink Temple because it’s made out of pink sandstone, but the real winner for us was the carvings. Banteay Srei is incredibly well preserved and is absolutely decked out in intricate carvings. 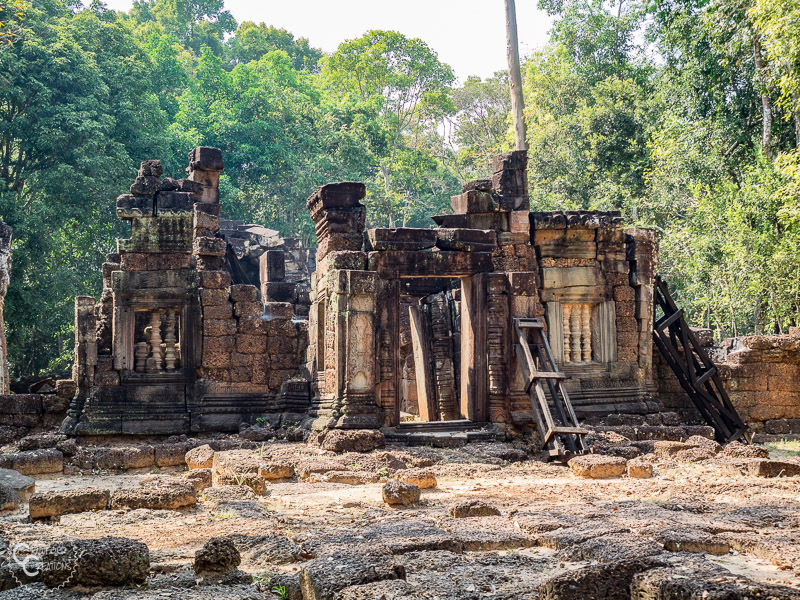 Unlike a lot of the other temples, at Banteay Srei you’re not allowed to explore inside the towers or even walk around the interior section of the temple. You can only walk just on the inside of the temple wall pictured above. I’m sure keeping the tourists out of the main part of the temple is part of what has helped keep it so immaculately preserved. The other good part about not being able to get up close and personal is that you can actually get photos without a million tourists in them! What a concept. And yes, there are a lot of tourists here. We definitely pat ourselves on the back for getting up early and making it through the entrance first thing in the morning around 8:00. By the time we left at 9:30 the place was packed with tour groups. Banteay Srei is included in the Angkor Wat pass so you don’t have to pay extra to go in. 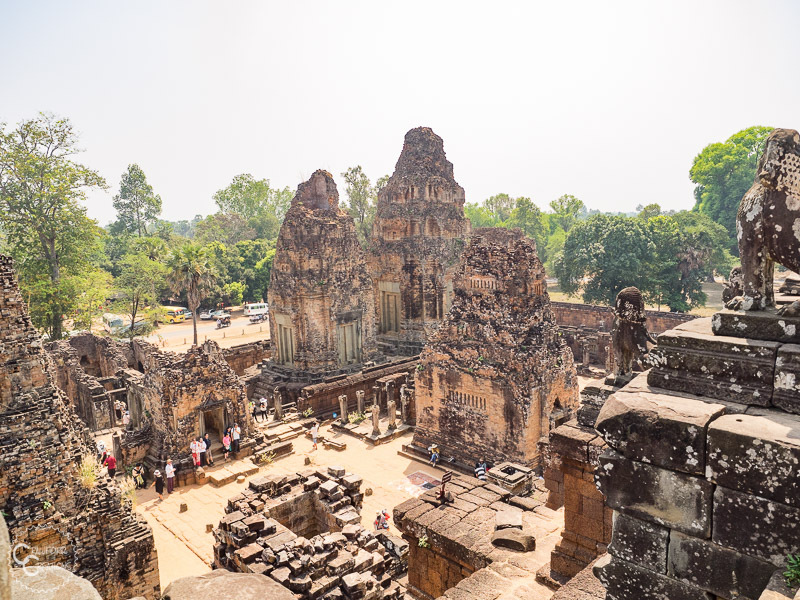 Back in Siem Reap, we picked up where we left off on day 6 with Pre Rup Temple. This is one of the bigger temples and is made up of an interesting mix of brick and stone. 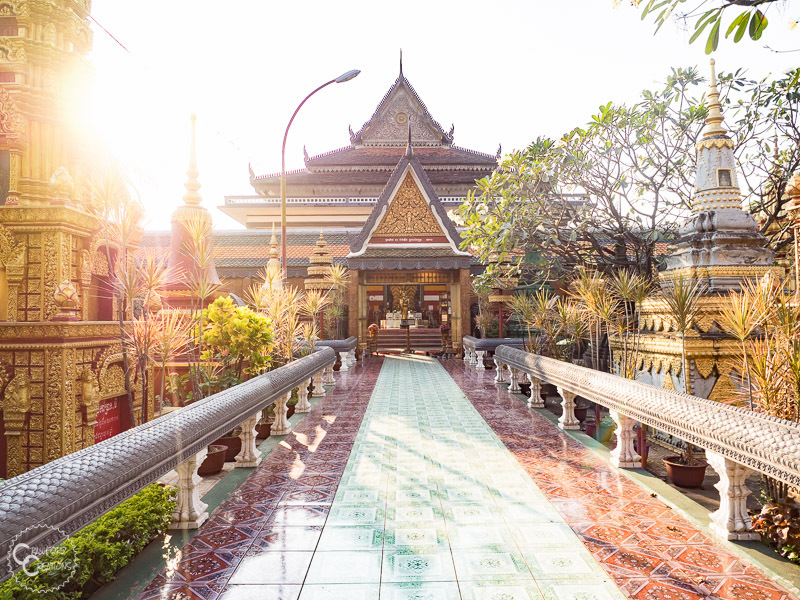 It’s also one of the two temples, along with Phnom Bakheng that’s open until 7:00 pm for sunset. While we saw the sunset from outside of the temple setting between two of the towers on day 3 you would also get an awesome view from where this picture is taken at the top of the temple. At this point in the trip we were honestly getting a bit templed out, so we opted to skip all the tiny temples across the road from Pre Rup and head over to Banteay Kdei. There wasn’t too much unique about this temple, but it was definitely still worth exploring. It kind of reminded me of a cross between Phimeanakas and Preah Khan. Our final temple of the trip was the famous Ta Prohm. You can thank Tomb Raider for the crazy amount of tourists at this place and the long line to take a picture in front of this tree. But honestly, there were a lot less crowds here than there were at Angkor Wat. 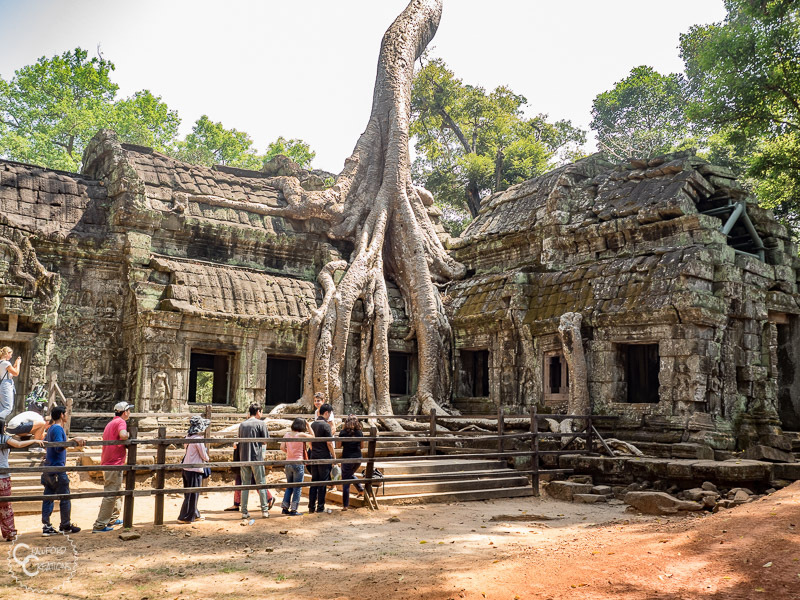 The major difference though was that Ta Prohm actually lived up to its hype. This temple is probably the most overtaken of all of the Angkor Wat temples by jungle. It’s actually in quite a bit of disrepair and was being reconstructed when we were there. Ta Phrom is the temple featured in Tomb Raider where Angelina Jolie meets that little girl, finds a flower and falls through into the underground tomb. We were really surprised at how cool this place was despite its fame and would definitely recommend a visit! 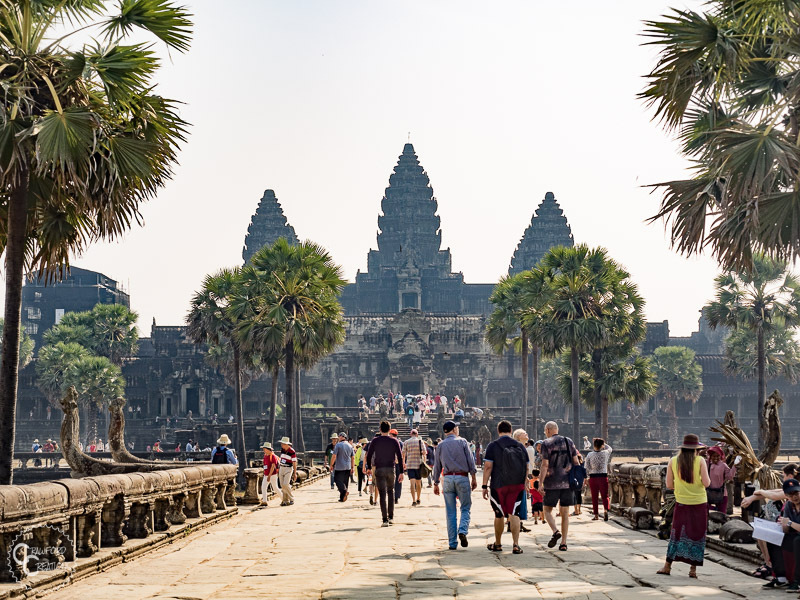 Wednesday is a holy day in Cambodia, so keep in mind that if you decide to visit Angkor Wat on a Wednesday, like we did, you won’t be able to climb to the top of the towers. Lots of locals do weekend trips to both Angkor Wat and Phnom Kulen National Park, so expect bigger crowds there on Saturdays & Sundays. 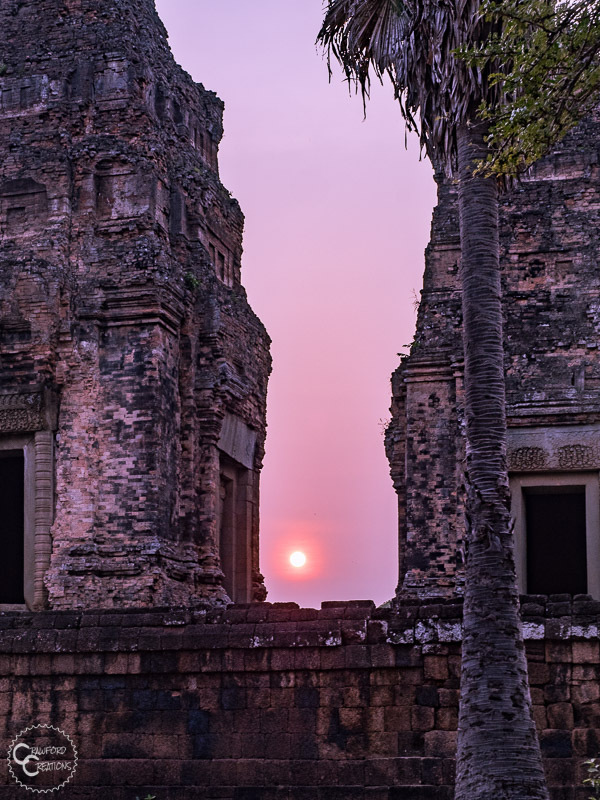 Watch the sunset at Angkor Wat on days you HAVEN’T already used your temple pass. Remember, it’s FREE to enter the park after 5:30 pm. The guards won’t stamp your ticket or even look at it for that matter.